Katarina lived in a big city with a lot of tall buildings. There was a lot of noise in the city. People shouted at each other, cars honked their horns and mamas dragged their crying children to the shops. Katarina's favorite place to go was to her bedroom. She would shut the door and windows and play with her dolls and teddy bear. Her mama kept busy painting. She was an artist and sold many of her works to museums and art galleries. Katarina's papa owned a bakery and had to leave early in the mornings to make bread and pastries for his customers. After Mama had finished, they walked back home. Instead of plugging her ears, she listened to the noises of the city and smiled. When the painting dried, Mama put it up on the wall. “That's your best painting yet,” Papa said. Every time Katarina went into the living room, she stopped to look at the picture. Sometimes she stood at the window and looked out at the buildings and the bustling crowds. 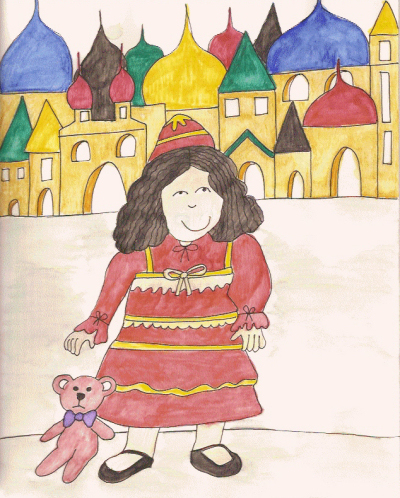 Instead of staying in her room all the time, she took her teddy and went for walks around the city. “I love the city,” she said and gave her teddy a hug.